Rockstar Energy Husqvarna Factory Racing’s Colton Haaker headed to round two of the AMA Endurocross Series held in Reno, NV looking build off the momentum he started after a dominating performance at the season opener. The championship points leader had a frustrating night, but he dug deep to land on the podium with a third-place finish, and remains firmly in the championship title fight. In the Super Endurocross seeded heat race, Colton got off to a second-place start, but after a mistake on lap one, lost touch with the leader. He still rode strong to come home in second place and punch his ticket to the points paying main event. 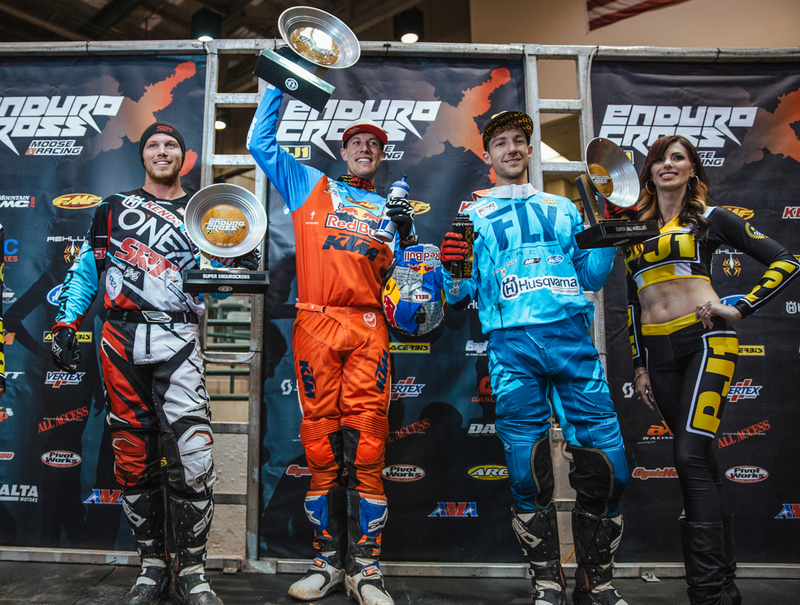 A chance to grab a championship point in the bracket racing segment was next on the schedule and Colton made quick work of his first two races as he grabbed wins to head to the third and final 1-lap head to head race against championship rival Cody Webb. Colton fought hard for the all-important holeshot, but went down in the first turn and finished second. Haaker headed to the Super Endurocross final focused, and grabbed the holeshot to jump into the lead. Haaker made an unfortunate mistake on the first lap to drop to second, then was inadvertently collected in two more crashes as riders ahead of him made the choice to enter the ’no joke’ lane as he was attempting to make passes. Colton pushed and dug deep the entire main event and overcame more crashes to charge all the way back to finish third in what was a very exciting 14 lap main event. Colton sits second in points as the series heads to Denver, CO for round three.